Forget FOMO - you got this! Embrace convenience & fly from your Los Angeles or nearby, with other college students or young professionals who have the same appreciation for brunch hotspots, local sports, happy hours, & experiencing all that the greater Phoenix & Arizona community has to offer. "I loved Shorashim because they keep the Israelis with the group for the whole time, and not just five of the days. 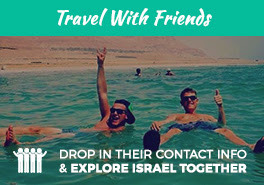 My connection with the Israelis on my bus, in addition to the connections formed with other Israelis because of my connection with the Israelis on my bus was a great experience. At the beginning of the trip, I made friends with the Israelis quickly, but still felt like an American that was overseas. Within a few days, I felt as if I was at home. I finally felt like I was in a familiar place that I belonged, which was strange, because it was my first time in Israel."